It is now 4:56 AM HAT Time on Sunday, April 21, 2019. Relay Online Registration closed at 11:59 PM on Fri, Feb 20, 2015. One Hour ePostal Shirts, Caps, and Patches may be purchased during your online meet entry or at this Shopping Cart link. 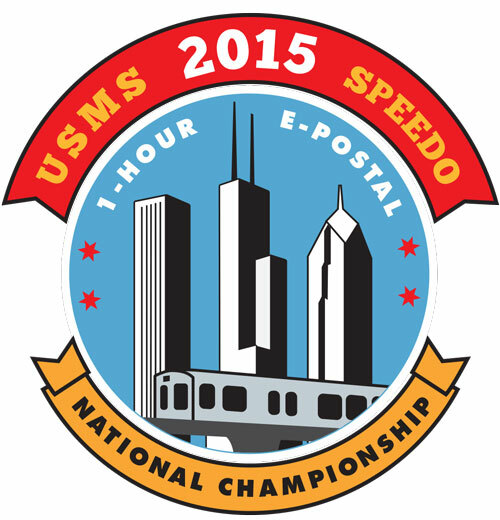 Swim your One Hour ePostal event FIRST ~~~ Then enter/register for the USMS One Hour ePostal National Championship. For your convenience, have your completed split sheet handy to enter your splits at the prompt. With the success of the online entry platform and keeping in step with the evolving electronic age, the USMS Postal National Championships are now known as the USMS ePostal National Championships and will no longer be offering or accepting paper entries. We encourage any participant who does not have easy access to a computer to reach out to his or her event counter/timer, coaches, teammates, family or friends to assist with processing your online ePostal entry. Date: The 1-Hour ePostal must be swum in its entirety during January 2015. All online individual entry submissions must be completed by 11:59PM HT on February 10, 2015. Completed split sheets for individual National Record breakers must be received by the event director by February 10, 2015. All online relay entry submissions must be completed by 11:59PM HT on February 20, 2015. Eligibility: This is a USMS-sanctioned event and all participants must be registered for 2015 with USMS (or the equivalent FINA organization for foreign swimmers) on or before the day of their swim. Foreign swimmers are not eligible for USMS records or All-American status. Online entries for USMS members will be verified automatically. All foreign swimmers who enter online must submit an electronic copy or mail a copy of their equivalent organization 2015 registration card to the event director by February 10, 2015. Fees: $7.00 for each individual USMS entry ($10.00 for foreign swimmers) and $16.00 for each relay entry. Fees are non-refundable. Online entries must be paid by credit card (Visa, MasterCard, Discover) to "ClubAssistant.com Events". Rules: The 2015 USMS Rules govern these events, including USMS Rule 102.12.1 regarding swimwear. Drafting, flotation, and propulsive devices (pull buoys, fins, paddles, snorkels, wet suits, etc.) are not permitted. No more than two swimmers may share a lane. If a lane is shared, each swimmer must stay on his or her side of the lane during the entire race (i.e. no circle swimming). An adult acting as a starter/head timer/referee shall be present at all times during the swim. Each swimmer must have a verifier to count laps and record cumulative splits every 50 yards or 50 meters. The timing of the event may be done with a stopwatch or electronic timing device. Distances are to be rounded down to the nearest completed five yard increment (i.e., round 2764 yards to 2760 yards). Online entries will be converted automatically from meters to yards if necessary. One person may serve as a counter for no more than two swimmers per heat. No adjustment may be made for swims completed at altitude. Splits: Cumulative split times must be recorded to the nearest second (final times for national records to the nearest 100th) on the official event split sheet available at http://www.usms.org/longdist/1hr_3000_6000_splits.pdf. Any split submitted without tenths or hundredths will be defaulted to .99 second. Any split submitted with tenths (.x) will be defaulted to .x9 second. Do not enter .00 if you have no tenths or hundredths of a second as a documented split. This split sheet must be kept for each swimmer. 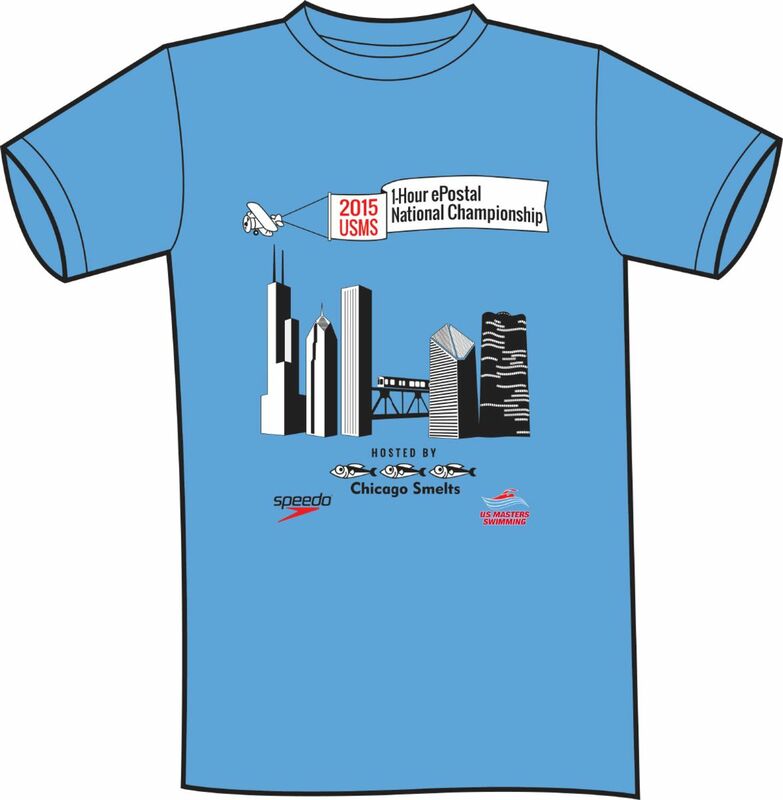 Awards: The top 10 finishers in each age group in the individual event and the top 6 relay teams in each relay age group will receive USMS Long Distance National Championship medals. First place finishers in each individual and relay age group will also receive a USMS Long Distance Championship patch, Only one patch per event per participant will be awarded. 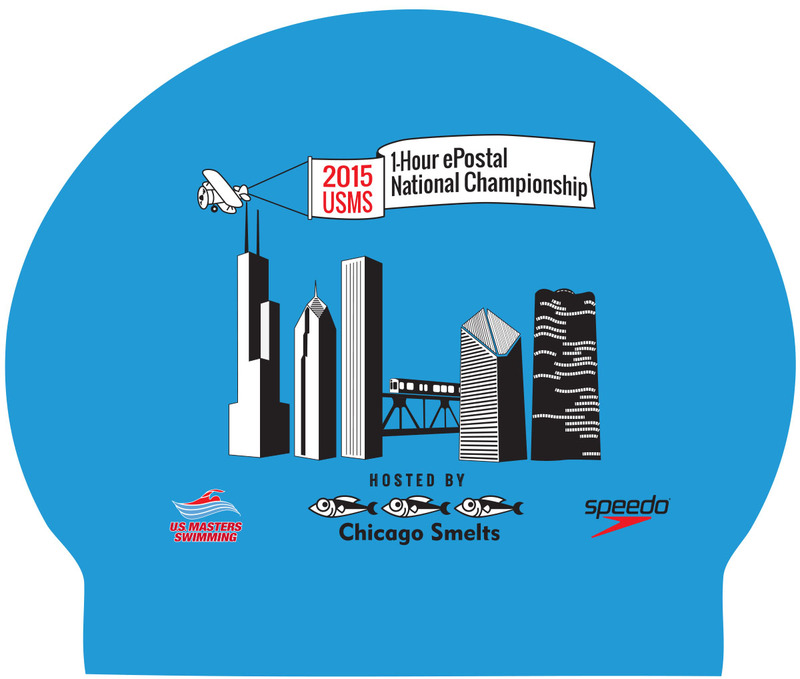 T-Shirts/Caps: The 2015 USMS 1-Hour ePostal National Championship T-shirts, caps, and patches (new item!) will be available for purchase and will be mailed to the participants AFTER the event has concluded and the results have been finalized in March. T-Shirts are $15 (FINA $20). T-shirts are available in Men's S-2XL and Women's S-2XL. Click for Men's sizing chart or Women's sizing chart. Caps are $10 (FINA $12). See patch sample above right, T-shirt sample at right, cap sample below right. Results: Complete results will be available via the internet. Preliminary results will be posted on the USMS website at www.usms.org by February 21, 2015 for two weeks. All corrections must be sent to the event director during those two weeks. Final results will be posted approximately one week later. Online Relay Entries: Online relay entries will open on February 13, 2015. All online individual entries will be displayed by USMS Club and will include the entrant's yardage for the Club Relay Coordinators/Builder's reference. You will only be able to view a listing of YOUR CLUB'S USMS entries. Online relay entries must be completed by 11:59PM HT on February 20, 2015. Online Registration closed on 2/10/2015.